So what is this magical and mysterious image, so delicately painted and coloured, the horse’s head only adding to its extraordinary dream-like calm? When might it have been painted? Even as I look at it now, I find it difficult to realise that, when I took this photograph recently, I was standing in the hugely tall central choir chapel behind the altar and 13th century crucifix in the Franciscan church of Arezzo. And it was ablaze with life and excitement. All its surfaces were filled in three tall, stacked storeys, stretching to further than I can crane back my neck, three layers of oddly juxtaposed mythical stories, much of it coming from the 13th century Golden Legend. This extraordinary fresco cycle of bizarrely varied tales has one section showing the imperial Roman battle between Constantine and Maxentius – where Constantine famously had a vision of a cross, won the battle, and thereafter welcomed Christianity in the western Roman empire. Between the opposing forces – depicted without any clash of arms, but in in perfect perspective and the most realistic shadows and reflective glints from the armour – runs this tranquil stream. None of the rest is at all like this fragment, but no two moments, no two details in the whole cycle are alike. The viewer is in the midst of a great pictorial book which can never be read too often. And I can’t wait to return with the World of Piero tour this time next year. 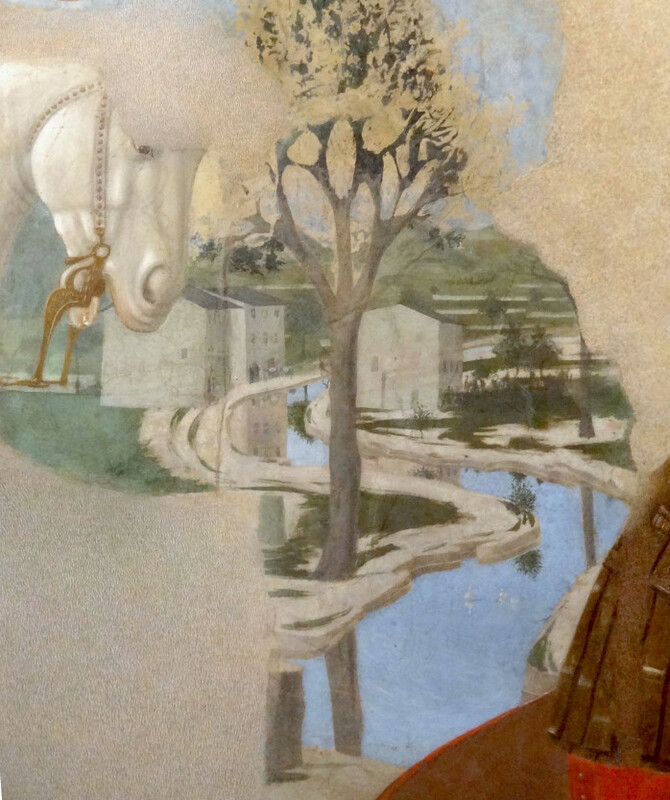 For all this was painted by Piero della Francesca, five hundred and fifty years ago.